Prepared with utmost care using the finest organic ingredients picked at the peak of ripeness. They are steam cooked to give you delicious baby food bursting with goodness & flavour. With just the right texture, these meals can be fed directly from the heart shaped bowl to help encourage the progression to family foods. 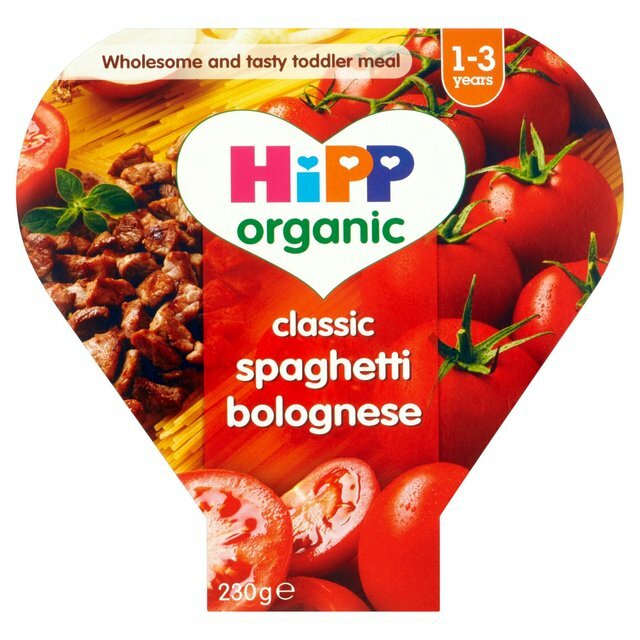 We have been feeding babies organically for over 50 years, so it's no wonder mums choose HiPP Organic time and time again. Always check the temperature before serving. Take care not to overheat, do not heat in a conventional oven. Microwave (From Ambient): (800w): Remove cardboard sleeve and pierce the film several times. Heat for 1 minute (cooking time may vary according to microwave power). Remove film and stir well to remove any hot spots. Spoon into a bowl or serve directly from the tray. Hob (From Ambient): Remove the cardboard sleeve and place the sealed tray in hot water for 6-8 minutes. his product contains no artificial colours, but the natural ingredients may cause staining of clothes and occasionally an orange tinge to the skin. This product left our factory in a faultless condition - please ensure that the pot and plastic film are undamaged before feeding. No refrigeration required. Store at room temperature. Unheated food can be stored, in a covered dish, in the fridge for up to 24 hours. If feeding direct from the tray, any remaining food at the end of the meal must be discarded. Never re-heat HiPP Organic toddler meals.